Discussion in 'The Sound Hound Lounge' started by Drew68, Apr 28, 2016. "And it was 'Purple Rain.'" Cool story. If it's been posted already, I'll pull it. Hard keeping up with all the Prince threads lately. FenderBigot, transmaniac, Cruciform and 9 others like this. thelatrobe33, MrLahey, John 14:6 and 6 others like this. As a teenager during the 80s and hearing both songs a bajillion times, it never occurred to me that they might be similar. After posting this thread, I went and revisited "Faithfully" and sure enough, Prince had reason to be concerned at how the members of Journey would react. Yet, "Purple Rain" is very much its own song. It never sounded like a rip-off. Seems Cain and Schon thought so as well. John 14:6, MrLahey, buddaman71 and 3 others like this. rdodson, Hallogallo, Clyde Billt and 13 others like this. Wasn't there that St Elmo's Fire song that was the flip of that? Stand up guy? Or just simply worried about being sued? After all, he did say, "I don't want you to sue me". He didn't say, "I borrowed your chords and wants to give you a cut", like Stevie Nicks offered to Prince for her song which had same chords as Little Red Corvette. Actually in reading the article Hit Charade in The Atlantic magazine, the guys who craft the big hits explained exactly what counts as "plagiarism in song writing"
EataPeach, MrLahey and Turi like this. Why would he offer them a cut? He didn't steal the melody. Ethn Hayabusa, MrLahey and chrisjw5 like this. It certainly was, and they should pay for their crimes against music. Wholeheartedly agree that what they did was lame but let's not turn this into a LZ beat-down thread, lol. Zeppelin brought a lot of American blues music to the world stage...no different than EC. Musicians have been stealing ideas and riffs from each other since time began. If what comes out sounds like it was put through a cheese grater...yet still has a bit of the vibe, no foul, IMO. 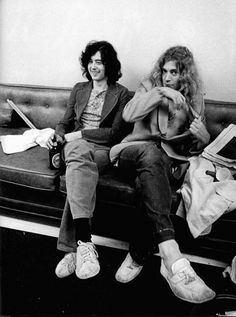 Ask yourself if you'd rather have a world with Zep music...or not. I'm also a fan of George Harrison, and like 'My Sweet Lord'...and no foul on him either! todaystomorrow, MrLahey, fishleehooker and 1 other person like this. "My Sweet Lord" is kinda different. He was successfully sued, but he knew his song sounded exactly the same asides from a couple of little bits, and the judge didn't think he did it deliberately. But the law is the law and it went down exactly as it should. Agreed, this isn't a thread about LZ, so let's avoid dragging it there. CC Overdrive and Turi like this. He didn't say, "I borrowed your chords and wants to give you a cut", like Stevie Nicks offered to Prince for her song which had same chords as Little Red Corvette. From the article, Jonathan Cain didn't want any sort of writing credit for "Purple Rain" believing it would be bad juju. Hey man you still in as a Navy Ordie, or long retired (not sure if '68 refers to birth year)? I'm Navy as well so recognized the patch. It also says Prince learnt loads of Neils licks which is pretty cool.. gives me another name to check out sometime. Never got into Journey, even though I everything I've heard from them.. I've had a few nights here and there watching the hits on youtube etc but haven't got any of their albums or dived deeper than what comes up on the 'tube. There's a lick Prince plays, in Purple Rain once, and in a lot of his other songs, that sounds just like or similar to that super fast bit from "Don't Stop Believing" - you know the part everyone is like "omg how do I do that bit? ", yeah Prince totally does that bit quite a bit. He doesn't spam it all solo it's just a lick I've noticed he plays a fair bit. '68 is my birth year but I'm still in! I was 34 when I enlisted. Barely made the age cut. Now I'm 47 and a 1st Class. Keeping my fingers crossed for AOC when the results come out. He didn't need to ask them anything. Not the same changes, not the same melody. Sounds like another story like the Michael Jackson/Daryl Hall/Billie Jean anecdote. MrLahey and Turi like this.